We are soooo excited to announce that we are expanding Cake Me! and launching our new venture Cake Me! kids. Cake Me! kids is a brand new concept, professionally teaching kids to sugar craft and decorate amazing cakes at birthday parties, utilising the skills and expertise of our Cake Me! team. This idea came about when planning for our own children's birthday parties this year. We love inviting friends over to celebrate our birthdays but at the same time, it can be extremely stressful thinking about how to entertain all the children. Then on the actual day of the party, things can get a bit hectic, running around ensuring that the guests are fed, and the children are entertained. Sometimes we get so busy that we don't even get to enjoy the festivities, which in our opinion, defeats the purpose of having a party in the first place. We are often asked if we run cake decorating classes or if we could hold sugar sculpting tutorials, however with two children of our own, we have not had the time. Having professionally worked with children and young adults for over twelve years, and seeing how our own kids both LOVE craft and cake decorating (our daughter helped decorate her own cake when she was just two years old, and our son was playing with fondant at eighteen months old), it ALL CLICKED. Cake Me! 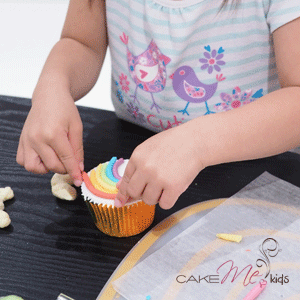 kids is about teaching crafty kids to create their own masterpieces and eat it too! It takes the stress out of entertaining for the hosts, and most importantly, it is so much fun for all the guests. Professional cake decorating and sugar sculpting tutorials will be tailored to the age of the guests and tailored to the theme of the party. All cakes, cake decorating tools and materials will be supplied, so the hosts wont need to prepare anything. Guests will be able to take home their own Cake Me! apron, Cake Me! bakers hat... and their own boxed Cake Me! creation. Please subscribe to our blog if you would like to find out how our new venture goes!